Aleon 15'' Business Attache Aluminum Hardside Business Briefcase (Onyx) Black by ALEON at Jetstream Cat. Hurry! Limited time offer. Offer valid only while supplies last. 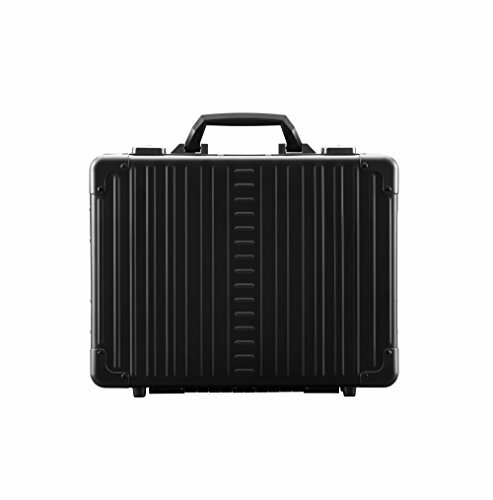 Aleon's 15'' Business Attache Aircraft Grade AluminumThis hard body case is made of Aircraft Grade Aluminum, extremely durable and lightweight. This hard body case is made of Aircraft Grade Aluminum, extremely durable and lightweight. The solid Aluminum frame is secured with riveted construction and double reinforced corners for extra strength. The sturdy square corners give this case a modern look and added interior space. Inside - this case is fitted with a seamless rubber seal to ensure that the case is water resistant. Aleon's lining is made of coated polyester. It's stain resistant and water repellant with nonabrasive fabric that it won't harm your possessions. The Removable Business organizer has two pen pockets, two accessory pockets, a padded tablet pocket, and can accommodate a laptop up to 15". Included but not pictured- a sturdy shoulder strap and an over the handle belt to secure it to your other rolling luggage. Aleon is proud to facilitate in-house production, responsible for all the manufactured elements of these high-end luggage pieces -- excluding the TSA locks -- we keep our cost down and give the savings back to you. Two TSA-Approved Dual Draw Bolt Lock Closures with Resettable Combination Locks. Piano Hinges and Double-reinforced corners offer added durability. The removable interior business organizer keeps your business essentials secure and in place, and the interior continious rubber seal keeps moisture and dirt out. 10 year limited warranty that covers the repair of your cases in the unlikely event of a defect in materials or workmanship. If your case cannot be repaired, ALEON will replace it.